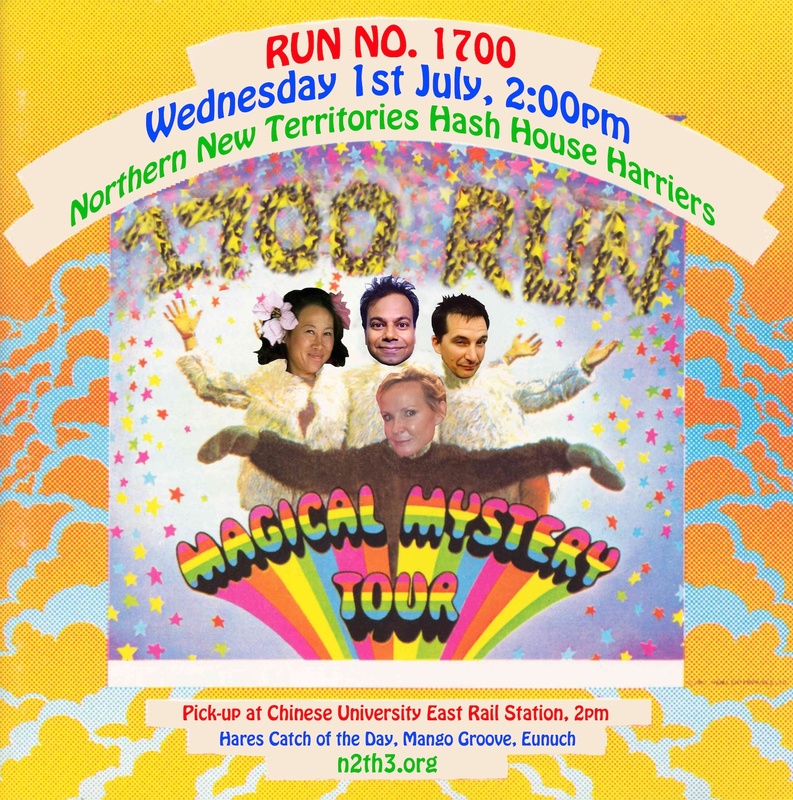 The 1700th run of the Northern New Territories Hash is fast approaching – and it falls on a public holiday, Wednesday, 1st July! We have a Magical Mystery Tour of a hash lined up, with fantastic runs on virgin trails, eskies brimful of cold beer and softies, maybe a surprise or two, and a great on-on to round it all off. Nobody need drive, so all can enjoy enjoy enjoy without worrying about the rozzers. We have a bus leaving Chinese University East Rail Station at 2pm, heading for our magical mystery destination. Following our magical mystery runs (there’ll be something to suit everybody) there will be an on-site circle, then the bus will leave for the magical mystery on-on somewhere in the Northern New Territories. Please join us to celebrate 1700 barmy runs. The price? $250 covers bus, runs, all the tramp juice you can gargle and an epic on-on. If you don’t go to the on-on, it’s $150. We do need to ensure we hire the right size bus or buses, so we are asking for a show of hands to gauge numbers and a deposit of $100 to show commitment. We are a penniless hash! Please reply via the e-group, and hand over your deposit to a committee member when you next see them.